@Sinxar maybe you know a bit more about it? These types of games seem to be your speciality. ps. think there's any chance of it being in the xmas sale? It is OK for a very early beta. Lot of weird little bugs but nothing showstopping just yet. Progression is very liner by gear tiers. For example iron armor/weapons then you move on to steel armor/weapons by combining iron ingots with coal. Right now you progress by crafting a boss summoning item. This boss will drop an item needed to craft a new workstation or starmap upgrade. There is a lot of variety to be had if you explore a lot of different worlds. You start off in the Alpha sector, these are threat level 1 worlds with fairly weak mobs and basic resources. The starmap upgrade system allows you to go up to tier 4 (Sector X). At 4 you can visit threat level 5 - 10 and instead of unlocking new sectors, you just unlock the ability to use new ores for better gear. No idea if each threat level will be divided up like the early game ones or not. I have found that higher threat level planets have different biomes available as well such as Volcanic or Tentacle biomes. You can build with any materials you find but personally I found it to be pointless to do so. If you put the crafting stations in your ship, you never have to worry about leaving them behind on accident. The only real reason to build any sort of structure is for a boss arena. Combat feels very clunky and overall game performance is terrible. Enemy AI (and friendly AI) is very bad. Many times mobs will get stuck on little ledges instead of trying to jump over. Crafting is scrolling though huge list of items with scrollbars that don't work. There is however a search function in the crafting window but unless you know what the item is called (and you are at the right station), it might as well not be there. Of course this will all be addressed at a later time. Right now there is no story, cant upgrade your ship and even some items don't have descriptions. Haven't tried multiplayer yet but maybe later today i'll see what that is about. There is a lot planned for the game and there is a good chance it will see most of what is promised in the final version. But until then it is basically a 2D space exploration sandbox. If you don't like the idea of beta testing with character wipes and frequent updates this game is not for you. hey, thanks sinxar for posting about Starbound. I thought you might be the best person to comment about it, and so was waiting to see what you say about it. It sounds like there are some good ideas mixed with some unfinished things. I dont like the idea of losing a character, as you know (from Terraria) building up a place, and developing your character is a huge part of the game. I guess its understandable being in a beta stage although - they havnt hid that. The spaceship sounds like a odd idea. I can understand that placing crafting stations on it would be easier. Does the spaceship require fuel or something to travel to the other sectors? or can you freely jump between them? once you have unlocked a new area. Probably for me, one of the most annoying things in Terraria was how you position blocks (especially background tiles) - it took so damn long to fill large areas. 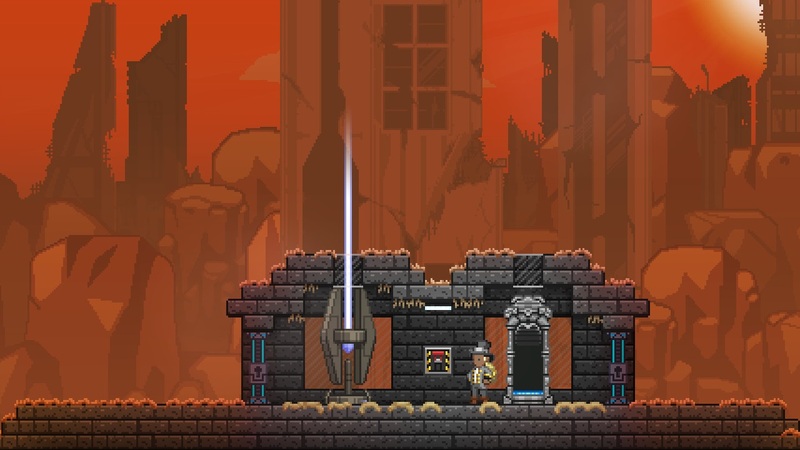 Is this any better in Starbound? Ya you have a tool to place blocks and it places in a 2x2 or you can press shift to put it one at a time. The foreground/background placement is controlled by right and left clicking. Its easy to get the hang of it and much faster than Terraria mainly due to the range of the tool. Using a pickaxe is the same way. It digs a 3x3 and you dig background or foreground blocks by right or left clicking and using shift for single block. You do need to fuel your ship. Early game this is done with coal and sorta creates a conflict with crafting since you also need coal for other things. Later though you start finding uranium, plutonium and some other high end fuel. Basically you can travel to anywhere at anytime as long as you got fuel. The first time I played it I didn't quite get the meaning of "Your ship isn't powerful enough to travel to the next sector". I thought I had to kill a boss to even leave the planet but turns out this is not the case. So with coal you can go ahead and leave the starting planet and travel anywhere in the Alpha sector, which is technically infinite in size but all planets have the same basic resources just different biomes and randomly generated mobs/towns/dungeons etc. What that statement actually means is that you need to kill the boss for the starmap upgrades that allow you to move on to more difficult areas. The game needs a lot of work and polish. Terrain generation isn't very good, AI needs to be improved a lot and guns are so underpowered they are mostly useless except for boss battles. It is my understanding that the stats and combat mechanics will be redone as well. I ran out of stuff to do so I guess i'll just wait for the next update and see what was fixed and added. thanks for posting, it does sound like a game worth waiting for - when all the problems are fixed, and things are balanced. Didnt the developer say they would keep supporting the game after release? Unlike Terraria, where the developers kind-of dropped it? You said you ran out of things to do, how long did it take you? its got serious potential, and the dev team is working well with the community, with a ton of content still being worked on. 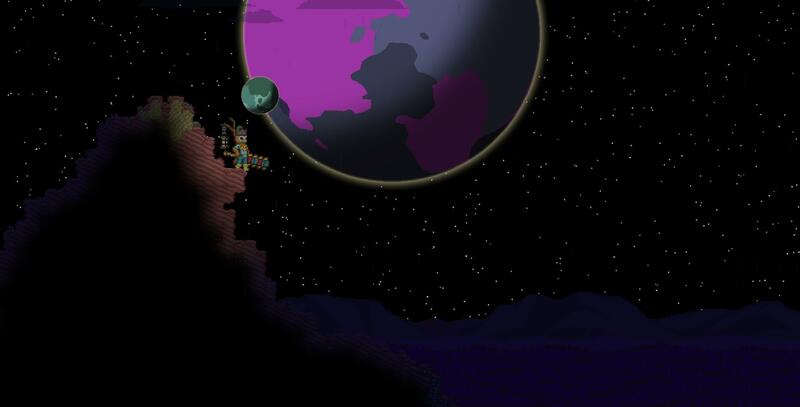 if you like terraria you will probably like starbound. It was abandoned for a long time. The only reason he decided to update it is because he ran out of money. Funny thing though is he didn't even fix the major bugs that has been in the game since release. Namely the money autostacking bug and the autosave world corruption bug. There was an update today. Patch notes can be found here: http://pastebin.com/qJXf3LSE. Some neat changes. Deleted my characters to get the full effect and so far it seems good. The gravity update is very nice. Mob AI got some tweaks making them more accurate in their attacks but still dumb as a rock overall. Still getting stuck on 2 block high things. Asteroid fields are now on the map but I don't have the equipment yet to try and land on them to see what that is about. I am guessing they are like the asteroids up in the sky on planets with uranium or better fuel in them. There is one annoying bug I have though and still hasn't been fixed. When I go to teleport to the planet surface it always puts me back in my ship. Takes 5 - 20 tries to get teleported to the surface. Hope that one gets fixed soon. This time though since you can now teleport directly to a home planet with the ship teleporter, I think I will take it slow and try to build and farm. Didn't try out the NPC spawners last time but this could be a good chance to see what kind of things you can make and free up a lot of space on the ship. Sounds like its moving in the right direction with the updates. It is a shame Terraria got abandon like it did; it could of been so much more. Any chance of a video (if you are building a new place)? Not sure where people are getting it wasn't abandoned. I even linked the official abandonment post. If english isn't your first language that is cool though. I imagine it would be difficult to grasp the meaning of "is" and "was" in this context. "Is" talking about now, the present. For example "Terraria IS being worked on. "Was" is past tense. Example, "Terrara WAS abandoned at one time". Maybe that can help clear it up? I guess its a bit wishful thinking - it was a shame that Terraria was abandoned - so many things could of been added. The guys developing Starbound said they dont abandon it, hopefully thats the case if it really gets going. Character wipes sound harsh atm. I played through Starbound over the past week or so and it is basically a totally different game, in a good way. Still has some of the basics from before but it feels much less grindy. So many systems were developed and implemented since I played it last. It is interesting. The game turned out quite good. Well I must admit that Ive looked at it a couple times but the price has been more than I wanted to pay. I guess the game is out of its development phase now, and is making some real progress? It also put me off a little as people said there was a lot of grinding in the game. I guess the game is out of its development phase now, and is making some real progress? Yeah its released and finished. Now more content is being added. I think they said space stations and a navigation computer revamp is next. My first terraformer. I thought this was always a thing (well since 1.0 anyway last year) but apparently it was only added recently. You can get them after beating the main story (no spoilers in case anyone who reads this hasn't played it). You can get keys to ancient vaults which are high end dungeons that give special loot in the form of a new currency and the ability to buy terraformers and upgrade certain weapons with said currency. I finally bought one and i'm terraforming a 'scorched' tier 6 planet to a 'dry grassland' to get rid of the effects of being on the surface (the scorched planet has a very high temp and requires special gear to be able to explore it at all). Once it is done, it retains the tier level so I am going to build a colony there and get all the sweet loots from the quest the colonist give. I actually have a very large colony on another low tier planet and didn't realise the planet level mattered. So whats your thoughts on starbound? is it worth a buy? or waiting for a discount? I guess the summer steam sales arent too far away. So is under the surface of the planet still a scorched planet? I guess that would make it hard to explore, but easy on the surface to build things? This page loaded in 0.00666 seconds. If you like to help, please consider making donation.